In conjunction with Shirley Klinghoffer: CRT Revisited, an exhibition inspired by hospital forms used to support women’s bodies during radiation therapy, artist Shirley Klinghoffer has invited others who have gone through cancer treatment to share their stories about the “healing objects” that accompanied them on their journey. Klinghoffer, who is a breast cancer survivor, shared her story, and now Teresa Wicks has shared her own. I had a breast biopsy done in mid-May of 2009 after being told I had an abnormal mammogram.. I told my husband that evening that I needed to go out and buy all my flowers to plant in my garden the next day since I would be home waiting for a phone call from the breast center with my biopsy results. I knew I wanted to keep my mind and hands occupied so I wouldn’t be sitting on pins and needles all day. As I was working in the yard, I was moving the wheelbarrow with a large bag of potting soil down to our back yard which involves negotiating some steps. As I was easing the wheelbarrow down the steps, a very large butterfly like the one in my photo appeared and landed on the bag of soil. It was so big and beautiful in the morning light, it literally took my breath away. My mother had died from another form of cancer when I was 20. Now 32 years later, I sensed her presence via the butterfly telling me that no matter what the biopsy reveled, I would get through this. It was such a profound moment for me. About a half hour later, I did get the call telling me that the biopsy did reveal cancer in my left breast. Over the course of the next year, I underwent 6 rounds of chemotherapy and 5 surgeries which included a bilateral mastectomy and breast reconstruction. I have a strong family history of cancer due to a genetic mutation. Most all of my maternal family members who have had cancer have died. 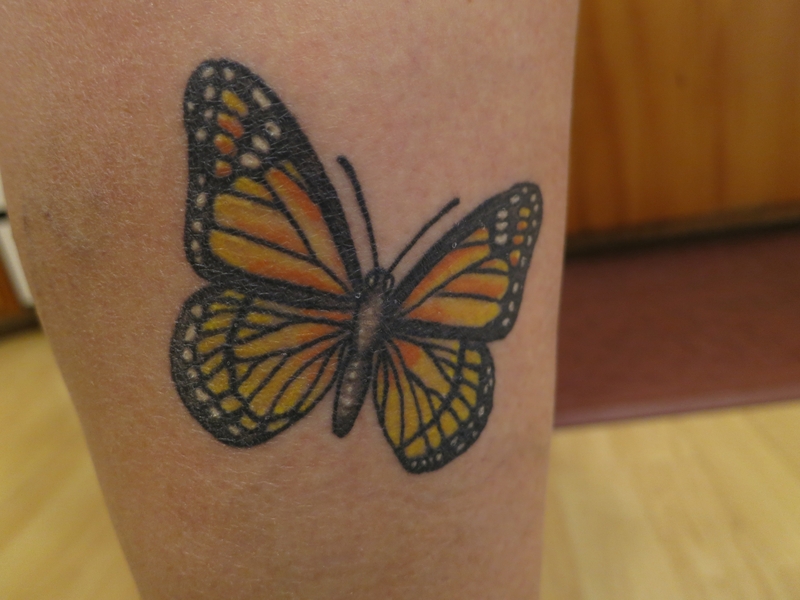 When I reached my 5 year milestone in 2014, I had a tattoo of a butterfly done on my lower leg to commemorate my anniversary and remind myself every day of the strength of being a survivor and all life lessons I gained from my experience. The most valuable lesson for me was truly living in the moment and not to worry about what may come. This was especially brought into my focus in April of 2014 when my husband was seriously injured with both head and neck injuries in a bicycle accident from which he has successfully recovered. Do you have a story to share? Download the submission form and instructions here. This entry was posted in Art, Exhibitions and tagged Cancer, Healing, Shirley Klinghoffer, Survivors, Therapy on January 30, 2015 by Museum of Glass.